10 Near indestructible creatures from ScienceDump. 2:56 video showcases 10 very tough, very long-lived animals. Everything from water bears and rotifers to 15,000 year old sponges made of glass, and an immortal cnidarian. The Adventures of Herman The autobiography of Squirmin' Herman the worm. Learn all about earthworms; their origin, taxonomy, anatomy, physiology, earthworm facts, what earthworms like to eat, growing your own worms, fun stuff (coloring, madlibs, jokes, etc. ), and links. Basically anything K-12 students need to know about earthworms is in here. It's part of the large Just for Kids and Schools Online sites, part of the University of Illinois Urban Extension Urban Programs Resource Network. 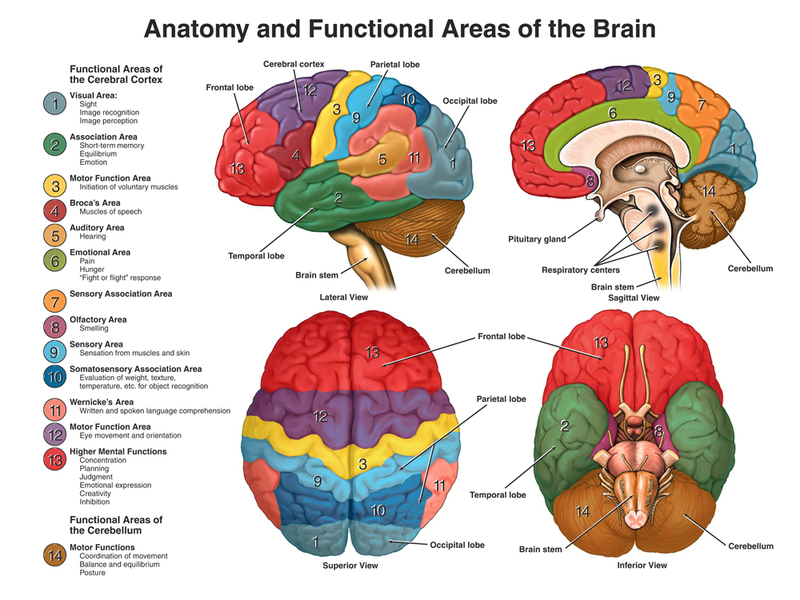 Anatomy and Functional Areas of the Brain This graphic is very useful for anatomy and physiology classes. Animal Planet is a place that's loaded with animal information and games! Their Petsource section has guides to cats, dogs, and other pets, cat and dog breed info, dog horoscopes (Whaaa? ), games, and more! The Wild Animals section has an A to Z listing of animals, bird guides, mammal guides, butterfly guides, an endangered species guide, and a lot more! The Games section is stupendous fun for kids of all ages. All these things can be reached from the golden menu bar near the top of the screen. Thanks Jessica. Animals and Classification Unit This Pinterest page offers classification-related sites from living vs nonliving, through the Kingdoms, and into taxonomic hierarchy. A good resource for this subject. "The Earth - our beautiful blue orb circling the sun is home to so many diverse species of animals. The Ark In Space serves as a compendium of these species in all their glory, drawing on the finest Creative Commons photographs available on the internet. So, enjoy your time on this website and revel in the beauty and diversity of our animal life. The Earth truly is an Ark In Space." Amazing and beautiful photography accompanies fact-filled short articles. ARKive "Explore 15,000 of the world’s endangered species. With over 100,000 photos and videos, discover what these animals, plants and fungi look like, what makes them special and why we should protect them." Fun stuff for kids! Games! Make an insect! Coral reefs! Food chains! Endangered species! Hibernation! Adaptation! Nocturnal hijinks! Penguin masks! Plants! Temperate rain forests! Quizzes! Adventure! Survival! Baby elephant videos! Habitats! Spawning salmon! Celebs! The Tripwire of Terror! Barn owls! China! Wrasse! Sharks out the yang! Biology, The Study of Life On Earth from KidsKnowIt is big with lots of explanations of terms. Biology4Kids! is a fine welcome to biology for elementary and up. Good information and links. Worth checking out for lesson plans, as is its companion chemistry site below. Biology Corner is a resource site for biology and other science teachers. It has lesson plans, web lessons, web quests, images, and quizzes. "The Biology Corner is a resource site for biology and science teachers. It contains a variety of lessons, quizzes, labs, web quests, and information on science topics. Biology is the study of life and living organisms, from the smallest bacteria to giant sequoias. Biologists use observation and experimentation to gain an understanding about the natural world." It's a gold mine for science teachers! Take a look at the first page and you'll be hooked! Biology for Kids from Kidepedia Covers cells, viruses, bacteria, fungi, plants, and animals. Also has activities, science projects, teacher's guide. Biology Games from KidsKnowIt OK, where else will you find Biology Hangman? Biology of Plants from the Missouri Botanical Garden. Everything is written in simple English, with kids in mind. When present, botanical terms are explained, in simple words. There's an introduction and seven topic pages. Each is opened by clicking its link in the left margin. All pages have graphics and videos. Most pages have games, songs, and lesson plans; some have all three. Easy for kids to use and understand. Biomedia (commercial site) Check out the menu bar. Explore the BioGalleries and Teacher Resources sections. The BioGalleries have wonderful pages about all sorts of microscopic life, including plankton! 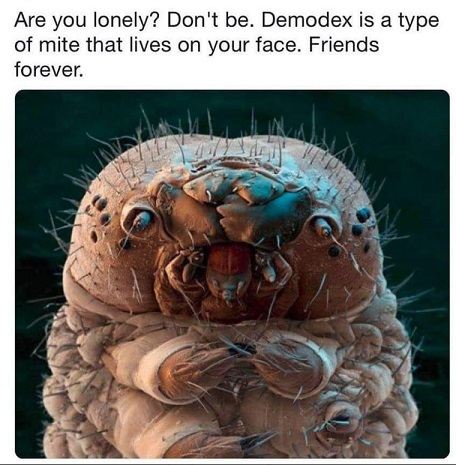 (even water bears!) Includes a What Phyla Am I? quiz with rollover answers. WONDERFUL PHOTOS! Build A Cell from Spongelab Choose between animal, plant, bacterial, or fungal cells. Then interactively build a cell part by part, learning about the cell's components along the way. This is one of 10 interactive games of this nature. Ready for use by teachers for classroom use, too. You should visit this site, it is fun to explore. CELLS Alive! Wonderful teaching site for cell biology and microbiology and more. Used by elementary and secondary schools alike. Engaging visuals and plenty of interactive activities keep kids interested. Interactive cell models of animals, plants, and bacteria; Mitosis, the Cell Cycle, and Meiosis (cell life and cell division); comparative sizes of pollen, hair, mites, bacteria, viruses; antibodies and neutrophils in action; microscopy (how microscopes work). Big sections on Cell Biology, Microbiology, Immunology, Microscopy, Cell Gallery; each with many individual topics, and everything is interactive! This site has really taken off recently! 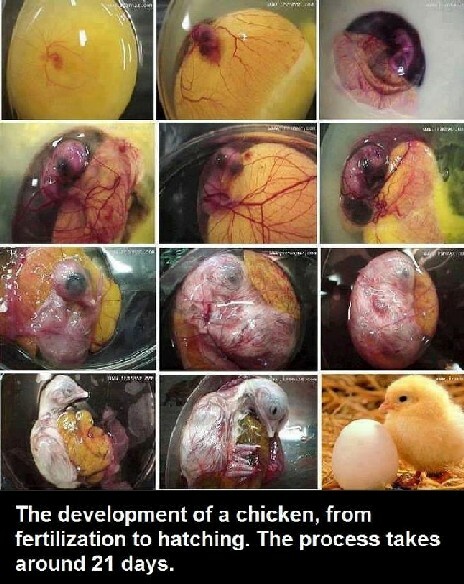 This graphic shows the stages of development of a chicken embryo. Clicking on it links to a great article with photos from The Poultry Site. A chick has been hatched outside its shell "In an awesome experiment performed by a group of Japanese high schoolers, a chick was successfully hatched outside of its egg shell. The chicken egg was placed in plastic wrap suspended over a plastic cup. Afterwards, the cup was covered and placed inside the incubator. According to Professor Tanaka, the biology professor in charge of the students, placing the egg in a clear plastic cup allows proper observation of the chicken embryo’s development. - See more at: http://www.viralvo.com/science-experiment/#sthash.mYReaSdZ.dpuf "
Classifying Animals (and plants, and all other living things). Find out how scientists have organized living things on the this page, and see an example (lions). From Fact Monster. Also see Taxonomy , for older students. For convergent, think wolves/coyotes/dingos vs the Thylacine (Tasmanian tiger). 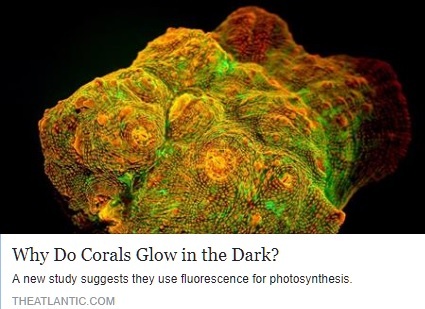 Why Do Corals Glow in the Dark? Read this article from The Atlantic and find out! Beautiful photos! Creepy Desert Creatures! a Brave Wilderness episode, one of a series. Coyote Bob Peterson, his cute, hyper, eight year old daughter Pup, and the crew visit Tucson, Arizona to discover some Creepy Desert Creatures! And find them they do, in this 22:30 Youtube offering! Watch the team as they examine: a giant desert centipede, a tarantula, an anthill of red ants, a solpugid (camel spider), finishing with a giant desert hairy scorpion under a black light which appears quite scary. Next the team checks out a Western Banded Gecko who's out hunting, (like everybody else in this video). Next. they find a Spadefoot Toad. Then, at last, a Western Diamondback Rattlesnake! Hyper Pup is not allowed to approach, but takes it in good grace. There are dozens of these videos for kids to watch! Cyberchase "an online destination designed to captivate, entertain, and improve problem-solving and math skills is now bigger and better than ever!" The Games section has over 40good applied math games. The Science section has activities plus an outstanding, ongoing series of Cyberchase Quest games. 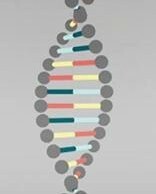 DNA explained via a beautiful animation "Three minutes is a short time to explore a subject where most doctorates only scratch the surface, so writer Andrew S. Walsh teamed up with molecular biologist Dr Matthew Adams to distil the script down to the most fundamental elements required to understand not only DNA’s form and function but how our understanding of these discoveries has affected the wider world." Dendrochronology from the NPS. This interactive presentation of tree ring dating is quite good. Like Tree Ring Analysis, this is a fine lesson on tree ring dating. Part of a larger site. EEK! Environmental Education for Kids. This electronic magazine is for kids in grades 4-8. Surf around and learn more about the great outdoors. Every animal of any kind that lives in Wisconsin has a page in here somplace. The Creepy Critter Feature, Alien Invaders, Tracks Quiz for Beginners are all part of the wonderful Critter Corner, as is the Habitats section. Find out about woodland, lake, marsh, and prairie habitats and the animals that live there! Has a page for Teacher Resource section with lesson plans, too. From Wisconsin DNR. Encyclopedia of Life "Imagine an electronic page for each species of organism on Earth..." STUNNING new project from a group including the likes of Harvard University, the Field Museum, and the Smithsonian! Students and seekers of any age can type in the name of any living thing and (usually) see pictures and information! We had fun putting in names of plants, animals, and bacteria. Still a work in progress. Also has groups to join and ways you can help. The Eyes Have It from the San Diego Natural History Museum. Facts about vision, eyes and eye anatomy, also covers animal vision. Fetal Devopment Comparison Chart. This chart compares fetal development in fish, turtle, chicken, pig, and human. It begins at the top with the eggs and ends at the bottom with the adults. 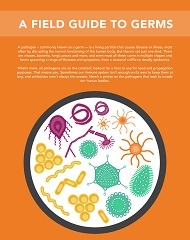 A Field Guide to Germs AKA Germs 101 is a big infographic (950 x 1200). It's about pathogens: bacteria, virus, fungi, protozoa and spirochetes (like malaria and syphilis), and oddballs like parasitic worms and prions (Mad Cow). There's a lot of information here. This is from Get Science and it's free. Five Kingdoms of Life for kids. Scientists group life into five "kingdoms" - (or six - or none - click here if you want to know more). Kids can learn about the kingdoms and what goes where at this site. From Fact Monster. From DNA to You - Understanding Genetics This interactive Flash lesson simply explains Mendel's discovery of dominant and recessive traits, using Mendel's peas. For middle grades and up. This was featured in Curriki. Gardening - Thematic Explorations Library from Kids Gardening. Here are 26 thematic units, most with Lessons & Activities and Resources sections. There is a lot of good resources and planning material in here. GeneTiCs Alive! Interactive teaching site for genetics with a layout similar to CELLS Alive!, but with different area of focus and a different author (kudos to Jonathan Tabb Sullivan). Activities include a Virtual Genetics Lab. Interactive section on Genes and Genomes: - What are Genes - Parts of a gene - Gene Translation - How Big is a genome. Each topic has several pages. Interactive section on Genes in Action: - What is Evolution - What is Inheritance - What are Mutations (each has several pages). Interactive section on Genetics as a Tool: - Genetics in the lab - Genetically modified food (includes pages on GMOs) - Genetics and Biofuels (each has several pages). Well explained and well presented. Suitable for upper elementary through high school, at the least. Google Streets in the Deep The Instructify site wrote: "The good people at Google Street View have recently partnered with The Catlin Seaview Survey to provide underwater street views (italics ours) of several breathtaking reefs around the world. You can take your students on a fieldtrip to swim with sea turtles and manta rays without having to be scuba-certified. From identifying the variety of aquatic life forms depicted in and around the reefs to writing short stories set in the reefs; the possibilities for classroom use are as wide as the ocean and as deep as the sea. You can explore the complete collection here." Great Plains Nature Center Website Index The Great Plains Nature Center in Wichita, Kansas is a wonderful place that lets all ages learn about the Great Plains' habitats: The prairie, woodlands, lakes, rivers, streams and wetlands, and the plants and animals who live there. Scroll down through their index. Make sure to look at the "INTERNET VERSIONS OF THE GPNC POCKET GUIDES". There are extensive! Guides for Raptors, Mammals, Snakes, Great Plains Shorebirds (Where else could you find that? ), Freshwater Mussels, Kansas Threatened and Endangered Species, Great Plains Waterbirds, and Wildflowers and Grasses. You will find information on every native animal, bird, fish, and plant in Kansas, most of which are native to all of the Great Plains of North America. Their Prairies of the World page is also worth a visit. So glad we found this site and are able to share it with you! The Heart: An Online Exploration from The Franklin Institute. "Explore the heart. Discover the complexities of its development and structure. Follow the blood through the blood vessels. Wander through the weblike body systems. Learn how to have a healthy heart and how to monitor your heart's health. Look back at the history of heart science." Links to excellent explorations of all the above areas, with an exceptional section on blood. For upper elementary through high school. 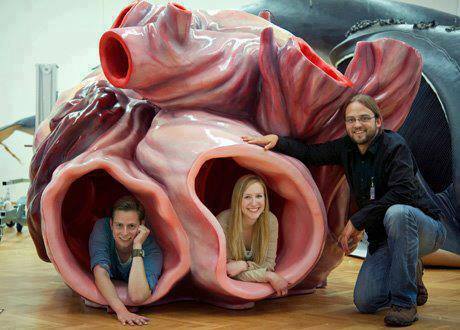 The heart of a Blue Whale is so big that people could fit inside! Don't worry, this is just a full sized model of the real heart. History of life on Earth - The Online Exhibits from UC Berkeley. The portal, the jumping off point for outstanding sources of biology education. 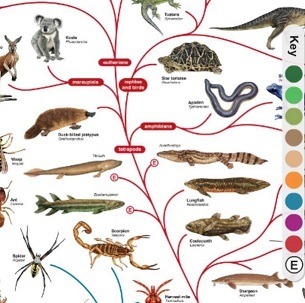 From here one can go to: History of Life Through Time "This enormous collection catalogs life on Earth, focusing on the ancestor/descendant relationships which connect all organisms, past and present." Tour of geologic time "Journey through geologic time to see how the Earth has changed since its debut 4.5 billion years ago." Understanding Evolution "...includes discussion of evolutionary theory, evidence for evolution, the relevance of evolution to our daily lives, and the history of evolutionary thought." Paleontology Portal "The Paleontology Portal focuses on the fossil record of North America, including state-by-state U.S. paleontology, fossil photo galleries, and resources." K-12 education resources "Activities and lessons specifically for K-12 teachers and their students." Also features The World's Biomes, and more. Human Biology section of KidsKnowIt. Good and simple explanations. Infection Detection Protection from the American Museum of Natural History. Meet the Microbes/Bacteria in the Cafeteria game, Infection ("The Game where YOU Are the Germ! "), and How Lou Got the Flu. A fun way for kids to learn some disease vector basics. Invertebrate Notes is a good intro to the major invertebrate phyla (but no water bears!) with a lot of clear and readable information. Seven Workbench Projects to try, including how series and parallel circuits work. Kids Guide to the Parts of A Flower is an educational offering from Avas Flowers, a commercial florist. This page does a good job of covering the names of the different parts and what they are for. A very strong point/gold mine is their list of links to 22* kid-friendly flower links, which offer plenty of awesome graphics, activities, and printable worksheets. * There are three more links but they're broken: # 3 Functions and Parts of a Plant (PDF), # 15 Kids Guide to Flower Pollination (PDF), and # 20 Plant Games and Quizzes. Kids' Habitat from the San Diego Natural History Museum. Currently covers canines, eyes and vision, minerals, dinosaurs, bioluminescence, sharks, and Ms. Frizzle! Worth exploring. Thanks, Ginne. Life from Windows to the Universe. "What is life? Does this sound like a strange question to you? Of course we all know what is meant by the word "life", but how would you define it? Explore the links at the right to learn more about the stuff life is made of, genetics, the diversity of living things, how they coexist in ecosystems and evolve over time." Lights Alive! from the San Diego Natural History Museum. Explore living creatures that light up! Facts and activities about animals with bioluminescence. 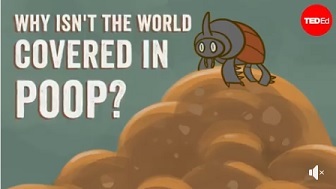 Microbeworld covers everything microbial. Keeps you current with the latest microbe news; FAQs on microbes, viruses, bacteria, and prions; microbiology as a profession, resources for educators (a hotlist of links); and a great section called ASM Articles which today features 24 articles that make good teaching springboards. Thanks, "Miss Sharon." Microscopy-UK is an excellent British site. The Micropolitan Museum is your gateway to "the finest microscopic masterpieces nature has ever produced ." Sections on freshwater life, saltwater life, insects, and plants - all under the microscope. Also has videos. The Pond Life Identification Kit has valuable information. Articles from their online magazine pop up all over Google. Examples are the water bear with its great video, and the visually stunning section on rotifers which begins here. This site makes heavy use of JAVA and avi videos. Mitochondria This one page, information-packed article tells you all you need to know about these organelles(= any of a number of organized or specialized structures within a living cell). Mitochondria were once independently living bacteria. They were absorbed by bigger cells and started doing new jobs to "pay the rent". Mitochondria are the energy source for everything that cells do. 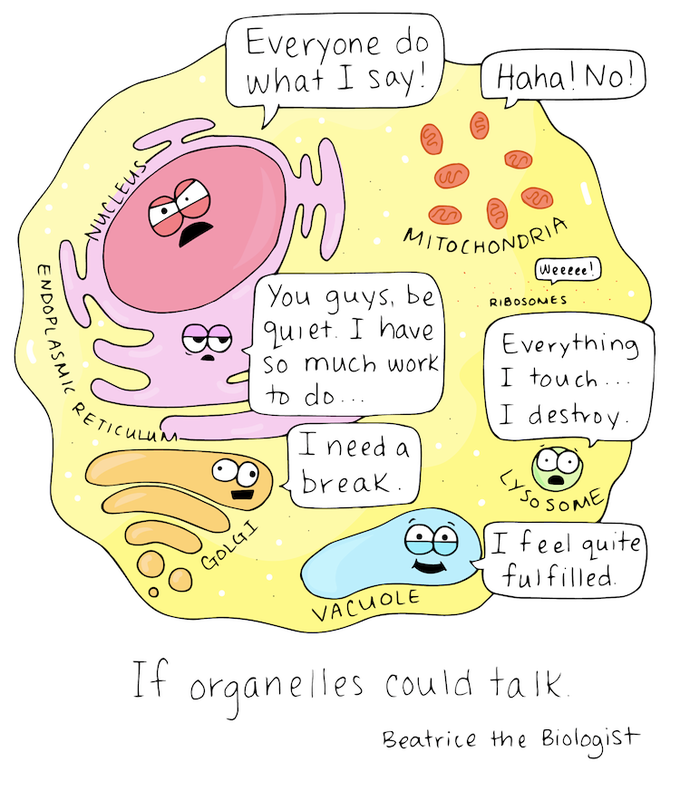 Mitochondria do many other really important things, to keep cells running as they should. You can read about them at this site! "Mitochondria’s double-membrane structure is essential to its role as energy producer: The outer membrane covers the organelle like a skin and the inner membrane has many folds called cristae. With increased surface area, the cristae allow for more chemical reactions." Car batteries have plates to increase their power for the same reason. Monterey Bay Aquarium's Kid's Corner and Teacher's Place Wow! Six live webcams, activities, games, lesson plans, printable teacher guides, learning activities, teaching units, songs with audio files, pdf files, video libraries. 168 pages of activities in the free, downloadable Sea Searcher's Handbook (PDF) alone! NBII Kids "At NBII Kids, you'll find games, puzzles, stories, and projects that help kids learn about nature and conservation while having fun." Also downloadable coloring pages and more. This is the "kid" part of NBII, the National Biological Information Infrastructure - a massive array of biology databases set up to be a sort of relational database management system. Biologists have got to be loving this, fun for lay people as well. Nature Adventures "Welcome to the home of the Emmy Nominated Television Series 'Nature Adventures With Terri And Todd', an educational and entertaining series created to showcase the beauty and wonder of the Midwest! Each season contains 13 fun, education-packed episodes. Terri Lawrenz and Todd Magnuson are your hosts!" They roam all over South Dakota and parts of adjacent states, checking out ecology and wildlife. The Online Learning section has all episodes from Seasons 1 and 2 are online as Flash videos! There are also resource links, video modules, photo galleries, and a glossary! Neuroscience for Kids "The smell of a flower - The memory of a walk in the park - The pain of stepping on a nail. These experiences are made possible by the 3 pounds of tissue in our heads...the BRAIN!! Neuroscience for Kids has been created for all students and teachers who would like to learn about the nervous system." Looks like this site is for Middle School and up. Ocean Collection for Kids This is a group of ocean sites for kids put together by faculty from Cal State LA. They cover ocean habitats, ocean mammals, and ocean fish. This is for elementary kids and has good simple explnations. Origin of MRSA. Simply explained by this UC Berkeley site. How did S. aureus morph from a minor skin infection to a terror? Plankton Chronicles"Plankton are any organisms that live in the water column and are incapable of swimming against a current. They provide a crucial source of food to many large aquatic organisms, such as fish and whales." (from Wikipedia) Watch videos and see photos of various sorts of plankton. There are 16 HD videos with more being added. Each narration explains the organism it's about. Very good quality videos with good sound, too. Click and explore the ocean and see different kinds of plankton emerge. This covers larval crustaceans, larval fish, cnidarians, ctenophores, diatoms, mollusks, tunicates, larval worms, various echinoderms, and more. All these can be plankton. Plants for Kids Yet another amazing long list of links from Kathi Mitchell. Just about anything kids need to know about plants is in here. We're probably going to break this list down later. Plants: From Seed To Flower This upper elementary and up site covers seed parts, monocots & dicots, plant reproduction, pollinations and pollinators, and growth cycles, and does it very well. It accesses other sites such as ThinkQuest and wraps it all into an organized package. Thanks to Elaine of khsteachers for the email suggesting this site. Proof of evolution that you can find on your own body a 4-minute video from Vox. "Vestigial structures are evolution's leftovers — body parts that, through inheritance, have outlived the context in which they arose. Some of the most delightful reminders of the common ancestry we share with other animals, they show that the building blocks of the human body predate our species by hundreds of millions of years." Sci4Kids: stories about bugs. "Stories! Stories! Stories!" Tons of fun facts about "bugs!" Sci4Kids: stories about plants. "Stories! Stories! Stories!" Tons of fun facts about plants! See Microbes with this DIY Phone Microscope Pretty cool and fast, too. Smartphone + laser pencil lens = microscope! Record what you see on your phone! This page has several other cool things to read about, too. STEMware: Zombie Plague from the Partnership for Biotechnology and Genomics Education, University of California - Davis. " In STEMware: Zombie Plague, students explore a 3D world where they are responsible for identifying the pathogenic microorganism causing a deadly outbreak and implementing a cure... the science content embedded in the software deals with diagnosis, treatment strategies, and career connections that are applicable to any disease caused by viruses, bacteria or fungi. Interactions with characters in-game, introduce students to the variety of career pathways in modern biology along with diagnostic technologies used in the real world. Embedded assessments allow teachers to track student interactions." Download the game here, or use the Curriki link above. It's a 305Mb zip file, so we suggest you save the file on a flash drive for future installs on more machines. Taxonomy - the science of classifying. Site is at an upper elementary level. Shows kids the six kingdoms with examples, explains the classification structure from kingdom down to species, explains origins of genus and species names. From Granite City High School in Illinois. 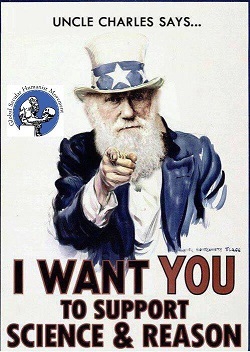 This is part of the Biology Corner resource site for science teachers. 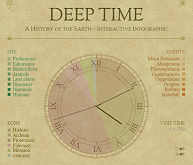 Timeline of Life's Evolution Wonderful interactive resource! A sliding time bar lets students go over 4.5 billion years in a few minutes. Click on the red button and pull it across from 4.5 to zero. Good reliable information and great graphics. The rest of the site, Understanding the RNA World and Building a Protocell, are for upper high school and college level. Tree of Lifefrom The Open University "Follow evolution and explore the variety of life on the planet with the Tree of Life." This interactive Flash file shows a simple tree of branches arrangement with typical examples of the organisms that belong there. It goes from primitive life at the bottom to the most complex life at the top. Students can zoom in and out to check out life forms and relationships. Each species has a description in a side window that appears when you click on its picture. The tree's branches may not be perfect, and there are things and relationships left out - perhaps in the interest of simplicity. Remember science ideas in general, and species origins and relationships in particular, are always changing as new things are found out. 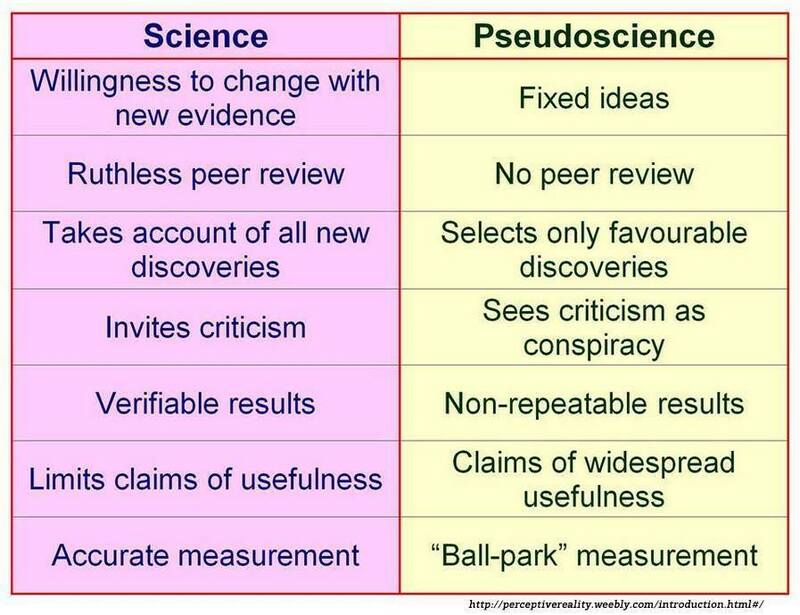 This is perfectly OK since the Scientific Method plays no favorites with ideas. Tree Ring Analysis Part of Bioweb, an excellent Canadian site listed in our Biomes section. 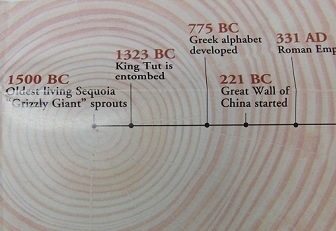 Like Dendrochronology, this is a fine lesson on tree ring dating. 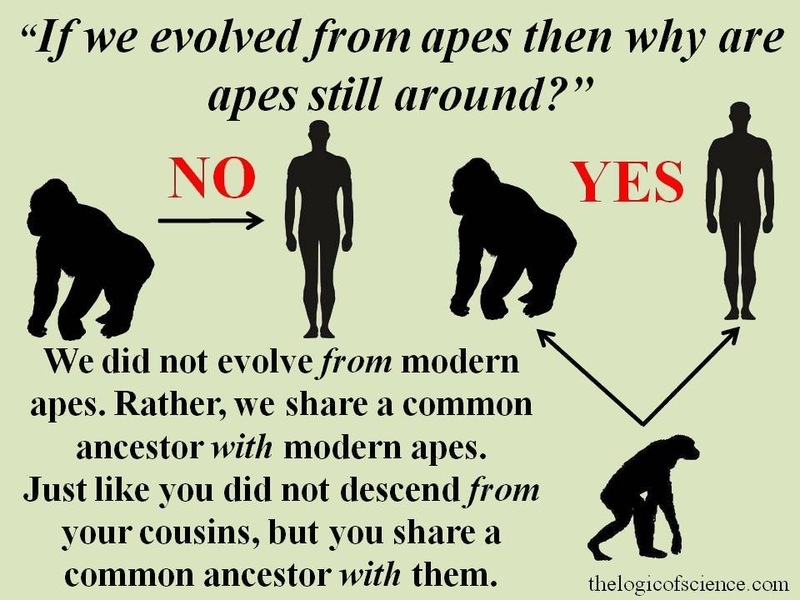 Understanding Evolution "Your One-Stop Source for information on evolution." 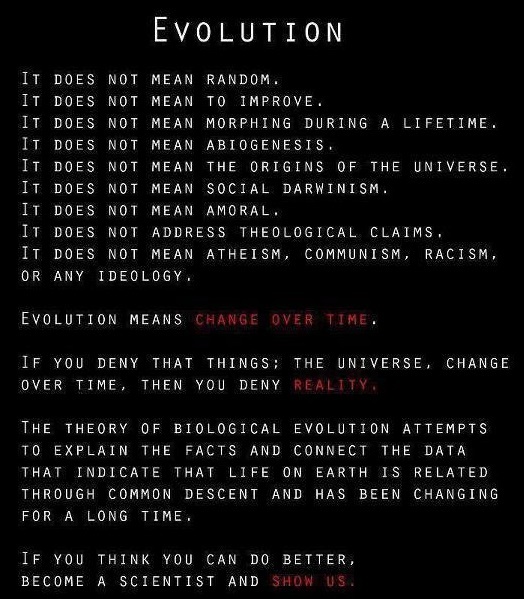 Evolution simply explained. This big group of web pages is subdivided into these areas: What is evolution and how does it work? How does evolution impact my life? What is the evidence for evolution? What is the history of evolutionary theory? From UC Berkeley. Video Lessons about Cells "Grades 9-10 / Ages 14-16. This collection includes videos/presentations on the cell and different cell structures. This will include comparing different types of cells and the functions of the nucleus, mitochondria, cell membrane, ribosomes, vacuoles, endoplasmic reticulum, golgi body, lysosome, chloroplast, cytoplasm and cell wall." One of the 80+ STEM Curated Collections/Lesson Plans from Curriki! The Virtual Microscope from University of Illinois. Oh you've got to get this for kids! Amazing closeups! Plug in a digital projector and show these on the wall! "The Virtual Microscope is a NASA-funded project that provides simulated scientific instrumentation for students and researchers worldwide as part of NASA's Virtual Laboratory initiative. This site serves as home base for the Imaging Technology Group's contributions to that project—namely virtual microscopes and the multi-dimensional, high-resolution image datasets they view. Currently we provide 90 samples totaling over 62 gigapixels of image data. The Virtual Microscope, which is available for free download supports functionality from electron, light, and scanning probe microscopes, datasets for these instruments, training materials to learn more about microscopy, and other related tools. The project is open source and the code is available on Sourceforge." Note: This program requires Java. More info at the site. Virtual Electron Microscope from the Discovery Channel is a sort of matching game. Given 10 slides, look at the images and description to sort them into the correct Name heading. Prety cool to use, good for grade school microbiology class. Virtual Roach We love the things ya'll submit! This is from Orkin, the famous pest control people. Nicely done 3D roach dissection helps students learn insect anatomy! "The Virtual Roach is a web resource focused on insect anatomy that was developed as a technical reference and an instructional tool. The interface for the system links morphological terms with an extensive image archive, including scientific illustrations, scanning electron micrographs, and photomicrographs. Images are linked in a manner permitting a detailed examination and virtual dissection of the American Cockroach." Yes, and it was fun to play with, too! Includes lesson ideas. Thank you, Steve Clark of Orkin Pest Control. Why Do Some Living Things Glow in the Dark? This interactive infographic is from National Geographic online. "An underwater glow. A fleeting gleam across a field. These lights seem mysterious, but organisms generate them for practical purposes. Bioluminescence fends off predators, lures prey, and attracts mates. Making light is such a useful trait that it has evolved independently at least 40 times. It occurs most commonly in the ocean, where bioluminescence is often the only source of light. Under the right conditions, a bioluminescent flash can be seen a hundred yards away. CLICK EACH ILLUSTRATION TO SEE IT ANIMATE" We did, they do, and it's both entertaining and educational. WolfQuest Episode 2 is out! Download it! From the Minnesota Zoo and EduWeb comes this excellent download wolf simulation game. Players become a wolf and explore Yellowstone Park! Kids from elementary to high school love to play this game, it's hard to get them to stop! We printed out the enclosed instructions for players to use. Needs a newer computer with good graphics. The download includes both episode 1 and 2.